Missionary travel and mission trips have been a part of Christianity from the start. Back then, travel was hard and required a major commitment of time and energy. Thanks to the Industrial Revolution, global travel has become faster and easier. This has made “missions” more accessible, not only to the missionary, but also to those who want to visit the mission field to learn, encourage and participate in what we call “short-term missions.” This movement, which began in the 1960’s, has experienced exponential growth and some estimate that nearly 2 million Americans participate annually in some kind of domestic or foreign trip. At DiscipleTrips, we believe that mission trips can be a valuable and a legitimate investment in the Kingdom… when done right! Even with modern technology and the internet, planning trips is not easy! Finding a location, arranging travel all the other logistics can seem overwhelming. At DiscipleTrips, we have decades of experience planning healthy mission experiences… taking PEOPLE we train & prepare to PLACES where they are useful to the mission effort and help accomplish the goal of world evangelism. “Trips made easy, Missions done right” is a sobering phrase that expresses our humble PURPOSE to engage people in missions and to see the Kingdom grow! Jeff, with Jerry and Connie Tallman from Michigan. 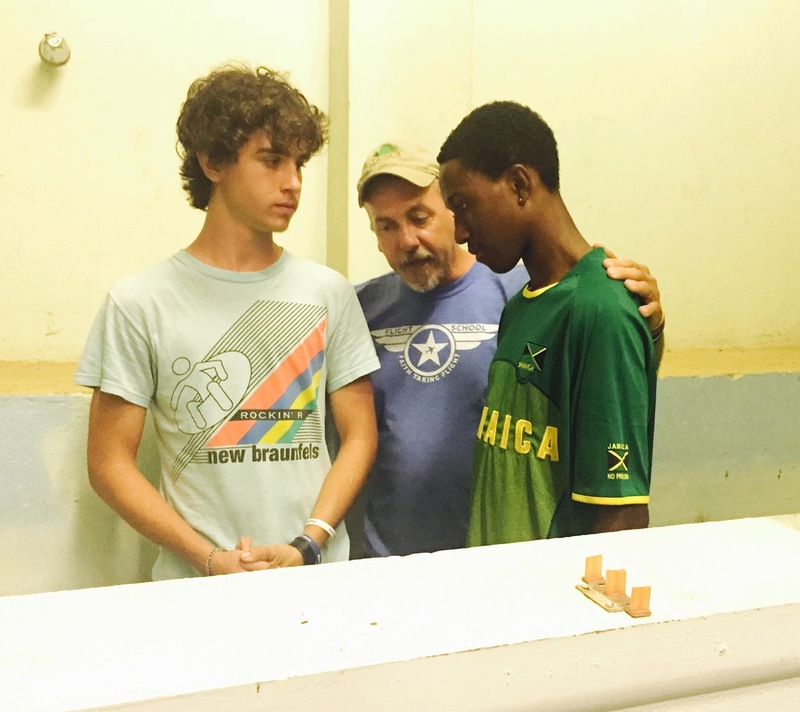 Four souls were baptized on this trip! We all love stories about heroes. Why? Maybe it’s because at some point in our lives we have all needed someone to come to our rescue. Superheroes are especially popular these days; my favorite is Superman. However, I prefer real life heroes where ordinary people wind up doing extraordinary things. On July 4th, a group of 17 regular people made their journey to the small Caribbean island of Antigua. They joined forces with members of the St. John’s Church of Christ to reach out to a lost community and to rescue them from darkness. Our daytime strategy was an outreach to children called Summer JAM where we had contact with nearly 100 neighborhood kids. This VBS type approach incorporated soccer with spiritual lessons, games and crafts. Under the cover of night, we expanded our mission by hosting a gospel meeting led by Jerry Tallman from Michigan entitled, “I Need a Hero.” Jerry, a gifted evangelist and speaker, brought practical messages about areas in our lives where we all struggle. Our strategy was to attract people to hear positive lessons about real life issues of finances, family and faith. Each night, he portrayed Jesus as the ultimate hero and challenged us all to give our lives and problems to Him. Kaleb and Jon baptizing CJ. We met him on the Bless Quest and he came asking for help to give his life to the Lord. By the end of our mission, four precious souls had invited Jesus to become their Lord and Savior (hero) and were baptized into Christ! These four found the ultimate hero because 17 lesser known heroes went on a mission. Praise God for ordinary people who are willing to do extraordinary things! Most mission trips are done with some kind of group. What about someone who doesn't have a group? What about individuals from smaller churches who don't have connections to go on a mission trip? That's where we come in. DiscipleTrips was born to make it possible for everyone to have a short-term mission experience! "The experience of DiscipleTrips and the souls I met will never escape me. Through DiscipleTrips, I truly realized the strength that I have in and from Christ. I can be a leader, despite my age. I can be a light despite the pressures surrounding me daily. With Jesus on your side, there is NOTHING you cannot do! This trip not only matured me spiritually, but also socially. My eyes were opened to a greater world." These two “solos” did an amazing job building relationships with the group and were invaluable members of our team! Other “solos” on the Honduras team were: Heather from New Mexico and Sean from Texas. Yes, it's always great to come with a group of people you know, but I applaud those who overcome their fear of "flying solo" to join one of our amazing teams!